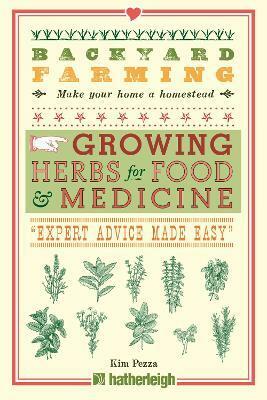 Comprehensive backyard farming guide to growing herbs for its many different uses in food and medicine. Backyard Farming: Growing Herbs for Food and Medicine is your one-stop guide for growing and utilizing herbs in your life. Intended to serve as a comprehensive primer for first-time gardeners, detailed illustrations and informative photographs help to eliminate confusion and ease new homesteaders into the world of backyard farming. Growing Herbs for Food and Medicine includes not only instructions on planting, but goes into detail the many different kinds of ways to use herbs such as marinades and garnishes for your meals or as natural remedies and medicinal cures for what ails you. Kim Pezza grew up among orchards and dairy and beef farms having lived most of her life in the Finger Lakes region. She has raised pigs, poultry and game birds, rabbits and goats, and is experienced in growing herbs and vegetables. In her spare time, Kim teaches workshops in a variety of areas, from art to making herb butter, oils and vinegars. She continues to learn new techniques and skills and now spends time between her grandparent's mid 1800's farm in New York and in Southwest Florida, the first and oldest cattle area in America and origin of the American cowboy.